I had the privilege of interviewing Jean Coffinberry, here's that interview. 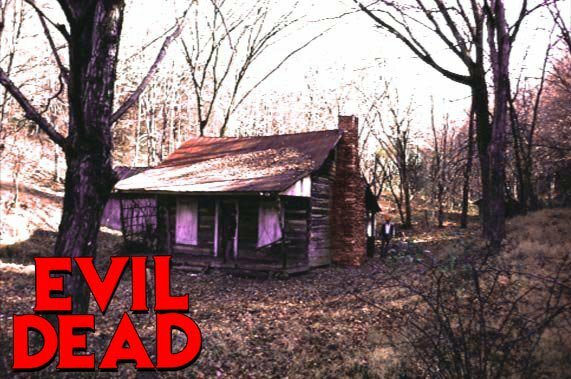 For those of you who don't know, Jean is known as the "Evil Dead Cabin" guy, so I took the chance to talk about one of my all time favourites. 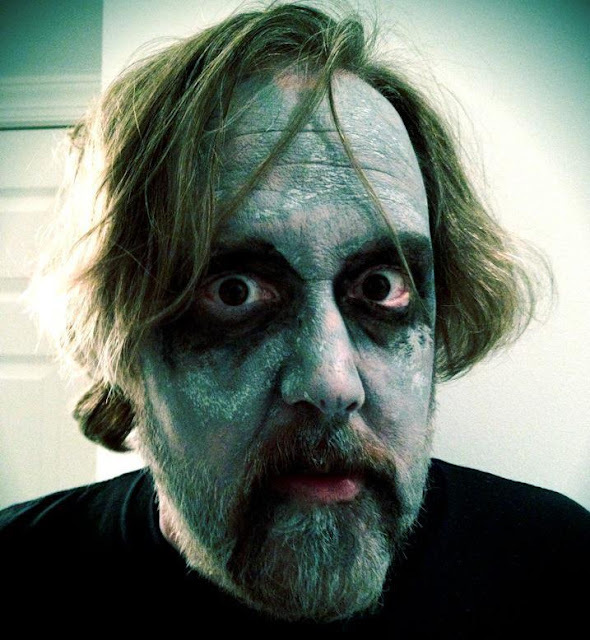 No problem man – always fun to talk about The Evil Dead. Q1: First off let me ask, why "Evil Dead"? Great question – and there is a story. Back in the early 80’s I lived in Palm Beach County and our local theater played the first run of The Evil Dead. I knew absolutely nothing about this film other than the ad in the local newspaper looked pretty compelling. On opening Friday I went with two friends and there was maybe 20 people in the theater at the start of the film. So the movie rolls and by the time the pencil goes in Linda’s ankle there was a mass exodus from the theater. This included one of the two friends I went with. People were literally freaking out and I recall being concerned they would turn off the movie. Needless to say, the times were different then and people were not really ready for much more than Jaws or Friday The 13th. I walked out of theater after the movie ended and we tracked down our friend who left and he said he just couldn’t take it and had to get out. I couldn’t believe what we had just seen. I went back the next day to see it again and they had pulled it from rotation. Did that movie even really exist or was some crazy nightmare! I spent the next two or three years telling other horror fans about The Evil Dead, but there was no VHS or viewable copies in those days and there was nothing to back up the hype I was putting out there. Later, in maybe 85 or 86 we tracked down the first available VHS copy from the local mom n pop video shop. I didn’t even have a VHS then. I would re-rent the tape and take it around to friend’s house’s on weekends when their parents weren’t around to check out the flick on their little box TVs. We dubbed copies for everyone and The Evil Dead became a “thing” on a local level for a little while. 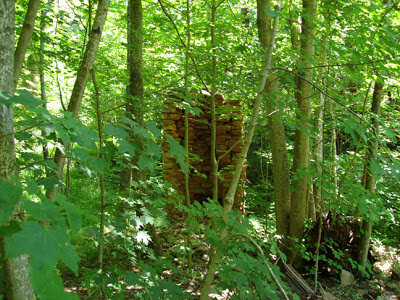 These things don’t happen that way today..
Q2: What made you want to find the cabin site? I have visited a few movie spots over the years. The Dawn of The Dead mall. The Exorcist steps in DC etc. So when we moved to Tennessee in early 2000’s and finding the cabin was an immediate priority. I knew it was in Morristown, which is only a couple hours from where we live in Nashville and eventually I discovered a map to the cabin posted in an old newsgroup feed online. Once it warmed up we ventured out. Q3: How hard was it to find? The directions I got were pretty good so it wasn’t hard to find. In 2003 or so this spot wasn’t exactly out in the middle of the forest. There are whole neighborhoods backing up to the spot now. The infamous trail going into the cabin spot is off a paved road with many homes nearby so I get dropped off and head in from there. About 10 feet down the walk there is no mistaking that this is Evil Dead path. It continues for maybe 50 yards then you enter the clearing where the cabin’s remains stand. The famous trees are still there at that point. It is very recognizable. It was very exciting! Q4: You've stated you won't tell anyone where the site is, is it still a big secret what with the internet age? I never made the location public, but one of these “visit locations from famous films” website did back around 2010 or so. I spoke to them several times asking them to remove the directions but they refused so it only took a few groups of people to go out and knock down what was left of the spot. It is just a big hole in the ground and the bottom part of the chimney now from what I hear. Needless to say I think these people were careless with the info and did no favors to fans of this film as there was a group working at the time to preserve the remains. Q5: What was your favourite moment from visiting the site? Coming upon the clearing probably. Seeing the hole they used for “the cellar” was very cool as well. I went out there twice. First time was just to look, second time was when I took all the photos. There are rumors that the ground where the cabin stood is filled with iron that conducts a lot of lightning and that’s what may have burned the cabin. I can confirm that the night we spent at a hotel within a mile from the cabin was on a spot that drew the craziest electrical storm I have ever seen in my life. 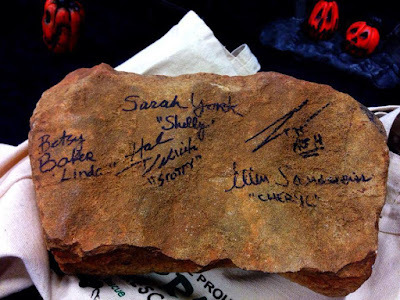 Q6: I saw you're signed "Evil Dead" brick (not jealous! ), what did the cast say when they saw it? Q7: What made you want to collect the dirt from the site? They used to sell dirt from Dracula’s Castle in the Carpathian mountains in the back of Famous Monsters magazine, which I still have a vial of. Getting some scoops of Evil Dead dirt seemed like a way to do the same for Deadite fans! 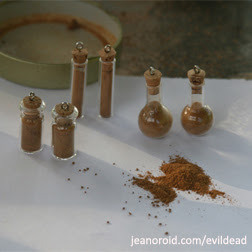 Q8: Where did the idea come from to start making "Evil Dead" merch such as dirt samples? I used to make a resin cast Book of The Dead that opened up to reveal a vial of dirt on the inside. People loved it and we would bring it around to shows but later the original creator of the book, Tom Sullivan contacted me (as he does with every person selling book art) threatening this and threatening that. We eventually resolved the issue and I sold the books for a while longer with him getting a cut of profits in exchange for an endorsement as such. Once I ran out of the copies though I stopped selling them altogether. I still sell vials for people that stumble across the website. I have pondered doing a “Tennessee: The Evil Dead State” T-shirt, so who knows. The latest “cabin” is in New Zealand so maybe they have some claim to all of this now. Q9: Do you have any plans to return to the cabin site? Probably not at this point. I don’t imagine there’s much left to see. Q10: Do you have any advice for anyone wanting to take a trip to the cabin site? That’s tough – as I have heard the two trees fell were knocked down and the chimney was mostly dismantled. 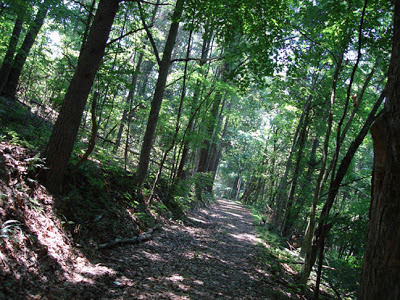 You would only get to see the path and the clearing otherwise. I would advise against going probably. I would offer that the photos from my visit remain online at evildeadcabin.com and if you are a fan of the film they are worth checking out! Read the book The Evil Dead Companion by Bill Warren. It’s got all the details about the making of The Evil Dead. I also made a video of my last visit to the spot and used it along with the song Tennessee Bloodbath from my band The Creeping Cruds (sorry it’s wobbly, this was before better cameras were available) (You can see it HERE). If you like horror rock stop on over to The Creeping Cruds Facebook page (HERE).